NASA has set March 18 as the soonest revised date for the launch of its NuSTAR X-ray satellite observatory, after delaying the “flight readiness review” it had scheduled for March 13. According to NASA’s mission page, NuSTAR is now on a six-day countdown (at the time of writing). NuSTAR is a belt-tightening novelty for the big-spending space agency: although it’s designed to catch hard X-rays from distant galaxies, it’s working to a shoestring budget of just $US165 million. Part of the low cost comes from an unusual launch approach. NuSTAR will be carried by a Pegasus XL vehicle which itself will be released from an Lockheed L-1101 aircraft over the Marshall Islands (where it now awaits lift-off). 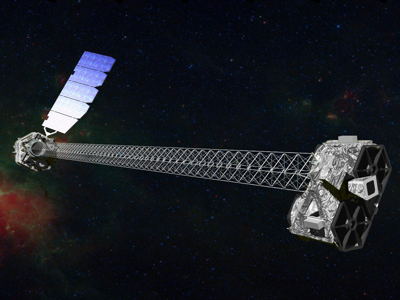 NuSTAR – the Nuclear Spectroscopic Telescope Array – is designed to detect “hard” X-rays at energies between 5 and 80 kiloelectronvolts. This radiation penetrates mirrors, which make it hard to focus onto a detector. The design team has created a sandwich of thin films, each of which is tuned to reflect photons of a specific energy. These films are arranged as nested conical shells. The mirrors are arranged so that instead of trying to capture X-rays striking them directly, they capture X-rays that are nearly parallel to the mirror surface. This, however, means there’s a much smaller collection area – a problem overcome by the nested mirror arrangement used in NuSTAR. The other design challenge, according to Nature, was to build a low-cost structure with a long focal length, and make it small enough to fit inside the Pegasus rocket. The solution was to create a 10-meter folding truss which will have to be deployed after NuSTAR reaches orbit.